We’d love your help. Let us know what’s wrong with this preview of The Harlequin by Nina Allan. In the aftermath of the Great War, Dennis Beaumont returns to London a haunted man. He finds himself unable to successfully return to his previous existence. Carelessly unfaithful, capricious and misanthropic, Beaumont could easily be a loathsome protagonist, but somehow he's sympathetic – relatable, even. Perhaps it's the strong sense of his postwar disenchantment and trauma; perhaps it's simply that he's so very, horribly human. Beaumont's London is luridly realised, a soup of misery peopled by In the aftermath of the Great War, Dennis Beaumont returns to London a haunted man. He finds himself unable to successfully return to his previous existence. Carelessly unfaithful, capricious and misanthropic, Beaumont could easily be a loathsome protagonist, but somehow he's sympathetic – relatable, even. Perhaps it's the strong sense of his postwar disenchantment and trauma; perhaps it's simply that he's so very, horribly human. Beaumont's London is luridly realised, a soup of misery peopled by the damaged and defeated. In my head, it looks like a Francis Bacon painting come to life. I am still in hell, Beaumont thought. Only now it is worse, because everyone pretends that the life we are living is the life we want. Something I keep noticing about Nina Allan's fiction: it's so multilayered. The introduction of The Harlequin gives the reader a great deal to chew on. The suggestion of a traumatic wartime incident that continues to trouble Beaumont. Numerous observations he makes of people around him – observations that tell us a lot about the man he is. References to Alain-Fournier's Le Grand Meaulnes, prompting an assertion (spoken by a friend, remembered by Beaumont) that 'memory is not fantasy. It is the bridge between the real and the imagined'. Allusions to Beaumont's relationship with his fiancée Lucy, about whom he seems to feel distinctly unenthusiastic. Alongside that, a contrasting portrait of Beaumont's sister Doris that underlines how much he cares for her. All this in the opening pages of a short book, all of it done effortlessly and with the lightest of touches. For the same reason, it's difficult to get a handle on what this story is actually about. At the halfway point, I was uncertain whether so much plot could be gathered together and resolved in the space allowed by what remained of the book. If there is a problem with The Harlequin, it's that the story doesn't have enough room to properly unfold; it could easily have been turned into a book two or even three times the length of this novella. As it happens, The Harlequin turns out to be 'about' quite a few things, and it's not easy to pinpoint exactly where its deep sense of unease stems from. Beaumont's outburst of violence? The death of fellow soldier Stephen Lovell, a memory he continually returns to? The sinister figure of Vladek in his patchwork coat? Does the latter spring from Beaumont's imagination – or somewhere darker still? This weird tale is both subtle and confounding. It leaves an impression, a mark, a stain. Allan brings her setting and period to life so vividly that I feel it's a place I've visited, that I could physically return to – though I wouldn't want to. Nina Allan's The Harlequin is a harrowingly dark novella that won The Novella Award 2015. It's one of the finest novellas I've read this year. It's a beautifully written and elegantly told story that kept me spellbound until the last word. This novella has quiet and tender beauty that is nicely balanced by darkness and brutality. Because this kind of a combination has always appealed to me, I was impressed by the story and its atmosphere. I found the story tou Originally published at Risingshadow. This novella has quiet and tender beauty that is nicely balanced by darkness and brutality. Because this kind of a combination has always appealed to me, I was impressed by the story and its atmosphere. I found the story touching, beautiful and harrowing, and I enjoyed its speculative fiction elements. The Harlequin is a story about Dennis Beaumont and his gradual descent into darkness. It's a gripping story that hooks the reader with its realistic vision of post-WWI England. As you read it, it grows on you and you'll notice that you won't be able to forget about what you've read, because the author writes effectively about the protagonist and his feelings. Dennis Beaumont drove ambulance in World War One and tried desperately to save a soldier called Stephen Lovell. After the war he returns to his house on Kennington Lane and meets his fiancée, Lucy, who seems to have changed and matured since he last saw her. A bit later Beaumont goes to see the woman whom the dead soldier loved and tells her of his final moments, because he promised to do so. He meets a woman called Billie and has a secret affair with her. Billie's porcelain harlequin intrigues and terrifies him... This is the beginning of a dark story. The Harlequin showcases Nina Allan's strengths and writing skills in a perfect way, because it's firmly rooted in reality, but is speckled with darkness. It's a haunting glimpse into the mind of a troubled man who tries to make sense of his life and tries to deal with what happened to the soldier he tried to save. The characterisation works well, because the characters come wonderfully alive on the pages of this novella. All of the important characters are wonderfully drawn and there are intriguing tensions between them. Dennis Beaumont is an interesting and realistic protagonist whose life has changed a lot, because World War One interrupted everything that he was about to do. He had to put his life on hold because of the war. When he returned from the war, he was a different man and darkness had taken hold of him. He noticed that his relationship with Lucy changed during the war, because there was a distance between them. I like the way the author writes about Beaumont's life and his problems. She has created a protagonist who is haunted and troubled by what happened during the war. It was interesting for me to read about his problems, because he had been altered by the war. All the violent acts that he witnessed changed him permanently - he was mentally scarred by what he experienced in the trenches. I enjoyed reading about what happened between Beaumont and a man called Vladek, because they tried to save the soldier in the ambulance. These scenes were excellent. It's nice that the author doesn't glorify violence and the horrors of war in this novella, but describes everything as realistically as possible. The horrors of World War One are described in a vivid way as the protagonist reminisces about the happenings. The author writes excellently about these things, because she never resorts to using overly sentimental prose that would ruin the story. She keeps the story stark and realistic, but deftly hints at something strange. The brutal and murderous act committed by Beaumont is one of the highlights of this novella. It shows how much Beaumont has changed as a person and how far he can go when facing an impossible situation. The events leading to this heinous act were handled perfectly, because Beaumont suddenly had to deal with something unexpected and felt cornered. One of the best things about this novella is that Nina Allan masterfully evokes a distinct sense of place and time and leads the reader into early 20th century England with her prose. She writes about the places, people and happenings with confidence and style. I can guarantee that when you read this novella, you'll be totally immersed into it and you'll be caught by surprise by the passing of time while reading it. It was a pleasure to read Nina Allan's prose, because she writes engaging prose with an emphasis on creating a realistic and unsettling atmosphere. The prose is full of nuances that emphasise the gradually deepening atmosphere and the protagonist's descent into darkness. The gradually deepening atmosphere and the descriptions of the protagonist's life and actions captivated me throughout the story. In my opinion, the author writes observant prose and her descriptions of different people are fascinatingly accurate and believable. She has a talent for creating good characters in novella-length stories. This novella is akin to classic weird tales, because Nina Allan builds up the atmosphere in a similar way as old masters of weird fiction did in their works and hints at certain things, but never underlines anything or underestimates her readership's intelligence by giving easy answers. This novella has a faint touch of Arthur Machen and Robert Aickman, so it will please those who have read classic weird tales. It's kind of like a sophisticatedly modern yet old-fashioned take on classic weird fiction with a strong nod towards literary fiction. This novella also reminded me slightly of the atmospheric and excellently acted British horror film Deathwatch (2002). The story is totally different from the film in terms of characters and happenings, but there are a few fascinating similarities between them, because they both tell of what happened during World War One. 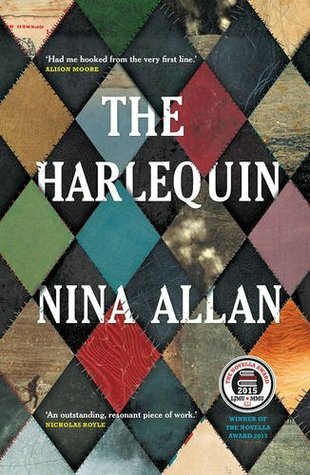 If you've never read anything by Nina Allan yet, The Harlequin is a perfect entry point to the author's fiction. If you enjoy find yourself enjoying this novella, please take a look at the author's other works, because they're worth reading. Nina Allan's The Harlequin is a fascinating, unsettling and memorable glimpse into the mind of a man whose life has been altered by war and whose experiences have deeply scarred him. Don't hesitate to read this novella, because it's something special. A beautifully written novella of almost perfect pace and length, detailing the return of a demobbed WWI soldier to an England he no longer recognises or feels part of; also, a subtly unnerving tale of uncanny, almost Faustian, events, capped with a subtly pitched ending. More a contrivance than a yarn. A subtle and disquieting story documenting a man's slide into madness and from there to darker places still. The characters are rich, real in their troubles, and the shift that transforms the tale is masterfully gripping. A clever and imaginative speculative story about the catastrophic effects of war (Great War) on its survivors. Had I’d been told that this had been written in the 30s or 40s by one of the leading writers of the time, I’d have believed it. Intricate, harrowing, demanding. The story of an unsettling peacetime nightmare experienced by a man who never escaped from the nightmare of war. An excellent read. Unpleasant, in a good way.